This is Not a Junkyard. FLORENCE, Ala., Feb. 28, 2017 /PRNewswire/ — PartCycle Technologies' e-commerce Marketplace, PartCycle.com, makes saving money on quality used auto parts easy. What parts buyers don't know—they are also supporting one of the largest recycling initiatives on the planet: the recycled automotive industry. "All parts on PartCycle.com are from modern professional automotive recyclers whose primary goal is to repurpose quality car parts using environmentally-sound methods," explains Brandon Gillis, PartCycle Co-Founder. "These are priced up to 50% less than the cost of a new part. So part buyers save money on the quality auto parts they need while making an environmentally conscious purchase." 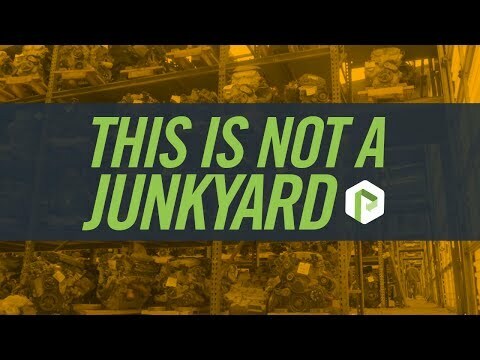 PartCycle co-founders Andy Alonso and Brandon Gillis discuss differences between a junkyard and a professional automotive recycler. The recycled automotive industry is one of the largest recycling initiatives on the planet, with professional recyclers abiding by robust product assurance and quality control procedures to ensure their recycled OEM parts meet stringent, industry-accepted standards. PartCycle.com offers only these quality recycled OEM parts, up to 50% less than the cost of new part. PartCycle Sellers recycle original equipment manufacturer (OEM) parts—meaning each part listed on PartCycle.com matches the automakers' requirements for direct fit, reliability and safety. Additionally, many PartCycle Sellers are members of industry organizations like the Automotive Recyclers Association (ARA), United Recyclers Group, and Team Premium Recycled Parts, who follow stringent national environmental regulations. According to ARA, using recycled OEM auto parts for vehicle repair is the "ultimate environmental choice." Automobiles are among the most recycled products in today's marketplace. The reutilization of quality OEM parts preserves natural resources, reduces the demand for scarce landfill space, and plays an important role in reducing air and water pollution. Each year the recycled automotive industry collects and reuses or recycles an estimated eight million gallons of gasoline and diesel fuel and 24 million gallons of motor oil, preventing these and other toxic automotive fluids from entering the groundwater and contaminating water supply. In addition, every new ton steel made from recycled vehicles conserves 2,500 pounds of iron ore and 1,400 pounds of coal (source: a-r-a.org). "We are proud to support an industry that has such a huge impact on our environment," says Gillis. "Using recycled parts is the purest form of recycling and saves our customers money. Everyone wins." PartCycle offers an economical, web-based solution for direct fit, environmentally-friendly auto parts that do not compromise product quality. Modern professional automotive recyclers, like PartCycle Sellers, have robust quality control procedures that ensure every part sold through PartCycle.com is clean, tested and backed by a standard warranty. About: PartCycle.com connects customers who need quality used auto parts with modern professional automotive recyclers through an easy-to-use, secure e-commerce platform.